I have noticed in my many years as a childcare worker, and now as a parent, how deeply kids are touched by children’s books with moral lessons. 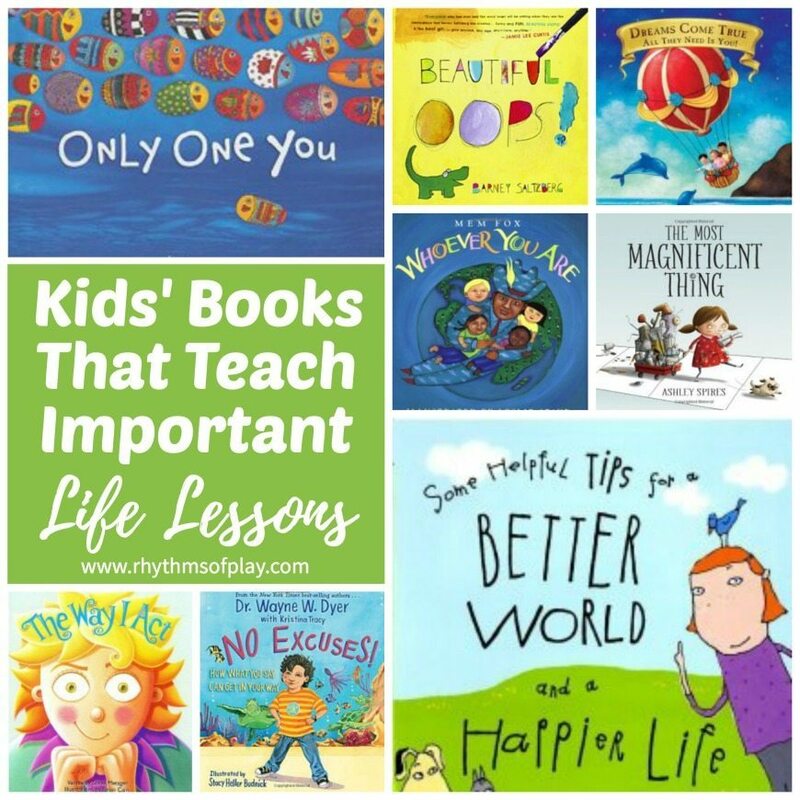 During the many years that I have been reading books that teach kids to children, these books that teach kids life lessons have stood out as some of the very best. Many of these children’s books with moral lessons are written by respected authors of adult books; educators, doctors, and spiritual teachers. They each recognized the need to share these important topics with the leaders of tomorrow–our children. Some, myself included, believe that these books are just as important for adults to read. May we all be inspired by these kids books that teach important life lessons! I have placed these children’s books that teach kids life lessons in order according to the publisher’s recommended age ranges. Search for these books that teach kids on your local library’s website and reserve them to check out. If you can’t find these books kids books that teach life lessons I have included affiliate links for your convenience. Click on the tile of the children’s book with moral lessons for purchase information and reviews. This is not a static book list for children. I will continue to add books that teach children and share wonderful messages like the books below as I find them, so be sure to bookmark this page for future reference. Shel Silverstein has long been one of my favorite authors. This book and “Where the Sidewalk Ends” were two of my favorites as a child. A wonderful book for readers of all ages that offers a sweet interpretation of the gift of giving and unjudgemental acceptance of another’s capacity to love in return. Little hands can do so many beautiful things. This book was created to inspire children everywhere to use their power to help themselves and others achieve their dreams! A special book with several wonderful tips to make this a better world and a happier place. This book has affected my daughter so profoundly that she makes funny faces in the mirror every day… one of the many wonderful tips in this sweet book. A mother and father share some of the wisdom they have gained through the years with their eager son. Their words, simple and powerful, are meant to comfort and guide him as he goes about exploring the world. A companion book to the bestselling Only One You. With its universal theme that life is the greatest journey of all as well as its celebration of the differences between all creatures, You Be You offers a positive message to readers of all ages. This wonderful book illustrates a life lesson that all parents want their children to learn, It’s OK to make a mistake! In fact, hooray for mistakes! A mistake can be an adventure in creativity! A celebration of the world and humankind told through simple rhyming text and beautiful illustrations. There is so much about this book that catches a child’s imagination and the many ways it can be used to enrich their understanding of the world around them. A wonderful book that will inspire your kids and your whole family! This is a story for anyone, at any age, who’s ever had an idea that seemed a little too big, too odd, too difficult. Nurture your ideas and you can change the world. More Inspiring Books that Kids Love! This funny book offers a perfect example of the rewards of perseverance and creativity. A girl decides to make something magnificent. From her efforts, children see the importance of planning, gathering supplies, building, and not giving up when a good idea doesn’t initially work out. Show your child how important the power of their choice is with this fun interactive book. “What Should Danny Do?” is written in a “Choose Your Own Story” style, where children get to choose what Danny does as they follow him through his day. As they navigate through the different storylines they will begin to see how their choices, good and bad, shape their lives into what they will be. This book delivers the powerful lessons that our thoughts create our reality in a way that children can understand. Kids can learn and understand the powerful idea that they have control over their thoughts and words, and in turn, what happens in their life. This silly little book shares things to be thankful for that can easily be used to teach gratitude any time of the year. Based on the simple concept of dreaming big, An Awesome Book! is the inspiring debut work of Los Angeles writer and artist Dallas Clayton. Written in the vein of classic imaginative tales, it is a sure hit for all generations, young and old. This whimsical little book of thanks can be read any time of year. It conveys all the ways one can be thankful, and all the different things in life to be thankful for. While geared toward young children, it is a book for the masses that spans age groups, gender, geographical, racial, and religious boundaries. Pete the cat is a super cool dude that never lets anything ruin his good attitude. No matter what happens to Pete, “It’s all good.” The fun rhymes and lyrical text are sure to please every child. There are several other “Pete the Cat” books and I recommend them all. They all teach children to be resilient no matter what comes their way. A new addition to our list that we love! This sweet book teaches children and adults about the transformative power of yoga. Not only does it strengthen bodies and calm minds, but with a little imagination, it shows us that ANYTHING is possible! Through an inspiring story, this book shares the powerful message that thoughts become things. Its simple text will seed real beliefs in real children about how to manifest the lives of their best and most magical dreams. This sweet little book is for anyone celebrating a milestone from preschoolers to college grads. It is a wonderful way to encourage and congratulate those that feel ready to spread their wings and fly. This is really a good little book. It shows children that they are not alone in their ‘BIG’ feelings and frustrations. Everyone has one of ‘those days’ sometimes. This simple and beautifully illustrated book urges us to accept our differences, to recognize our similarities, and to rejoice in both. Every day all over the world, children are laughing and crying, playing and learning, eating and sleeping. Their lives may be quite different. But inside, they are all alike. This book teaches that being different is cool, and being mean isn’t! This sweet story shares the ultimate strategy to combat bullying – respect, kindness, and being your best self. A wonderful read for children of all ages. Wayne believes that it’s never too early for children to know that they’re powerful beings that have everything they need to create happy lives. This is a great book for parents and children to go through together. Each lesson is discussed in a short rhyming manner with vibrant illustrations. Reading this book teaches children how to hold on to the no-limit thinking rather than just trying to “fit in.” In doing so, they can learn to truly enjoy life and become unstoppable as they strive to attain their dreams. The message this book delivers is truly invaluable; excuses can do more harm than we realize. Through a simple story, it shares that excuses are made by our own decision and limit what we achieve when we can really achieve what we set our minds to. I AM teaches kids a simple but profound message: God is not far off in the distance, or even merely beside us. We are not separate from God—we are God! This book addresses the topics of money and abundance. Children’s earliest thoughts and perceptions about money are those that will last throughout their lives. There will always be someone with more… and always someone with less than what you have. Teaching children to be positive at all income levels will build their self-esteem, pride, and confidence through life. This sweet little book contains 27 affirmations that will inspire you and your child to be all you can be. Kid’s love rhymes and this book rhymes its wisdom of the ages on every page. The ideas found inside this book are the most timeless laws of the universe, presented in the simplest of terms for young children. If we start them believing in these ideas early in life, our children will be much better equipt to find meaning, purpose, and happiness. This book celebrates and reminds us of the oneness of all life; and the wonder, joy, and beauty to be found in the present moment. Dr. Northrup believes that helping girls learn at a young age to value the wonder and uniqueness of their bodies can have positive benefits that will last throughout their lives. By reading this lovely book, little girls will learn how their bodies are perfect just the way they are. This book shares a wonderful lesson in the ups, downs, in’s and out’s of life for kids and adults of all ages. This wonderfully wise graduation speech is the perfect send-off for children starting out in the world, be they nursery school, high school, or college grads! This book gently guides children to understand how their actions express who they are. It really helps adults discuss concepts with kids that aren’t easily explained. Helping kids improve behavior and grow into wonderful people ‘seems to be the goal of this lovely book. Even if we don’t struggle with the same challenges as Temple has, we have all felt different at some point in our lives. This sweet story tells of how one girl turned what others saw as a weakness into a super-powered strength. Temple learned that she was different, not less. A wonderful lesson to share with children to inspire them to find their own strengths, even if they are different from everyone else. Originally published in 1971, this classic story goes all out to show the devastating consequences of human greed, and what can happen to the environment when humans misuse and take advantage of nature and natural resources. A warning that rings true today amidst the dangers of clear-cutting, pollution, and a general disregard for the earth’s environment. We hope that you and your children enjoy this wonderful collection of kids books that teach important life lessons. May we all be inspired by these powerful moral lessons for our children. Such a great list. I don’t have any books on these sorts of topics other than the Giving Tree but now my eldest is 4 years old I would like to add these to our book case. Thank you for sharing your list. There are some amazing books with sweet and simple stories in this collection. I hope your children enjoy the books that you select! Thanks for the list! I am a grandmother who loves to read, and I often buy books for my granddaughter and read to her. I am also a retired therapist, and think it is important to teach life lessons, and that stories are a great way to do this. You’re welcome, Peggy! So glad you appreciate it and feel the same way I do. I’m glad you have been able to witness first hand how miraculous a simple story can be to the psyche of a small child. 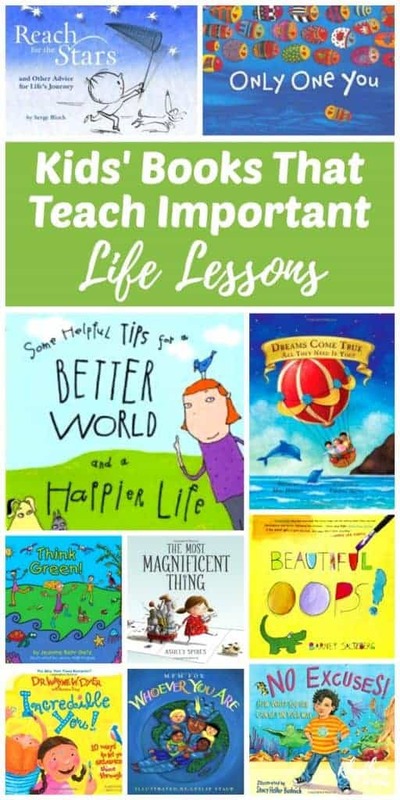 This looks like a great list of books on life lessons for children of all ages! My husband recently launched his new children’s book on amazon books, and it’s about children feeling empowered among other important topics. I’m just wondering how we may be able to get the word out about it. Would this be an appropriate site to post it? Any ideas are welcomed! Thanks, Pam. So glad to hear there are more books that empower children are being published! I really like how you talked about how these authors wanted to share important topics with children, who are the leaders of the future. My son loves the books that his teacher reads to him in school. I appreciate the list of books with great life lessons. This article is a perfect example of education and entertainment partnering each other. I hope parents will benefit from the information present on the website. Thanks to the writer. Thank you! I’m so glad that you can see the value of reading books like these to our children as a way to educate them, and ourselves! You are right because children’s books teach us for right thing. Yes, they can help our children learn values and morals!